If I’ve made these once, I’ve made them 50 times! They are delicious (better than you’d think), good for your body and everyone loves them! My kids and their friends even like them. They have the satisfying crunch of a salty potato chip but all the health benefits of a leafy green. They have become an easy go to snack for me and I hope you will consider making them a part of your repertoire. I even remembered to take a photo! 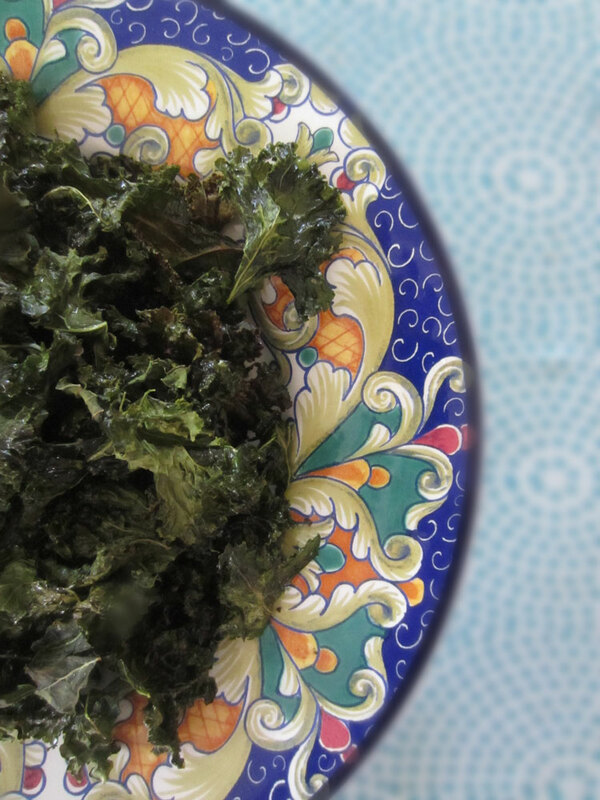 Wash and dry a bunch of curly kale, the kind you’re most likely to find in your market. Be sure the kale is dry! Tear the leaves into 3 or 4 inch pieces and discard the tough stems. Strew the leaves onto baking sheets in one layer. One bunch of kale usually fills two half sheet pans for me. Drizzle on olive oil and then massage into the kale with your hands. Salt and pepper to taste. Salt is important here. If you omit it, they will not be as tasty! And remember that pepper can make them a bit spicy. Bake in a 350 degree oven for 10 to 15 minutes. Be sure to watch them after 10 minutes to be sure they don’t burn. They need to be crisp and should not be brown. Serve after they’ve cooled a bit. They keep in a container for a few days, but in our house there are usually none left~!